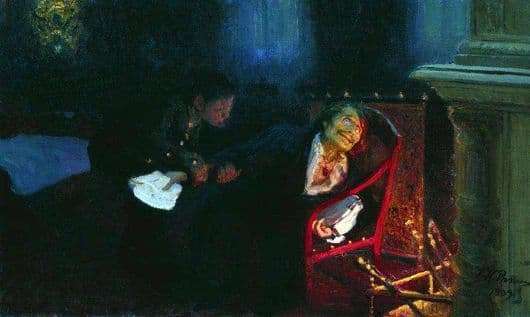 Repin’s painting “The Self-immolation of Gogol” was painted by the great artist in 1909. The canvas caused a lot of criticism, since many considered such an image of Gogol to be wrong and even a mockery of the writer’s glorified mind. But the name had nothing to do with the critics’ speculations, and the plot itself did not have a picture. The artist depicts two people in the picture: a person tormented by mental and apparently physical torments, who reclines, sprawled on a chair by the fireplace and his doctor, or a servant. The face of the first character of the picture is disfigured by excruciating pain, but his eyes shine with the hope that the flame devouring him from within will become cleansing and lead to the gates of Paradise. The figure of a man as if asks God for permission to stop suffering and to take him away. His clothes are wrinkled, the collar of the shirt is porvat, he holds sheets of paper in his hand – it is Gogol himself, and most likely this is the same manuscript of the second part of “Dead Souls”, which was burned by the writer, because it seemed insufficiently meaningful and successful. The second person in the room is located in the shadow of Repin’s idea; he tries to alleviate the suffering of the patient, which can be easily noticed by how carefully and even reverently he takes his hand. The artist forces the viewer to seek out and look out for what so excited Gogol, playing with shadows, drawing the fireplace, the luxurious chair on which the patient’s body rests, the second character, the bed and even two windows, with the help of which makes the room even more gloomy. The picture is full of sorrow and suffering, but, nevertheless, it is majestic and beautiful, as the very determination to renounce all worldly vanity and go towards something greater than the seeming eye of an ordinary person.